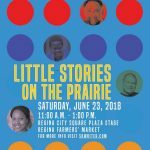 The Saskatchewan Writers’ Guild and the Multicultural Council of Saskatchewan are pleased to partner with the SaskTel Saskatchewan Jazz Festival to present, “Little Stories on the Prairie”, in celebration of Canadian Multiculturalism Day. Poetry, music, and dance performances will highlight and celebrate some of the diverse cultural voices in our province. Featuring poets Sandi Martinez, Ahmad Majid, Janelle “ecoaborijanelle” Pewapisconias, Peace Akintade, and musical guest Jebunessa Chapola & Her Bengla Team. Ahmad Majid is an Iraqi-Canadian poet who has been performing hip-hop and spoken word all over Canada for the last 9 years. His style combines intricate rhyme schemes with important social/political issues of human rights. He is a 3-time Slam-Team member and a Canadian Festival of Spoken Word 2013 Finalist. Peace Akintade is a Spoken Word artist, actor, scriptwriter, photographer, filmmaker, public speaker, and activist for Children education and human rights. 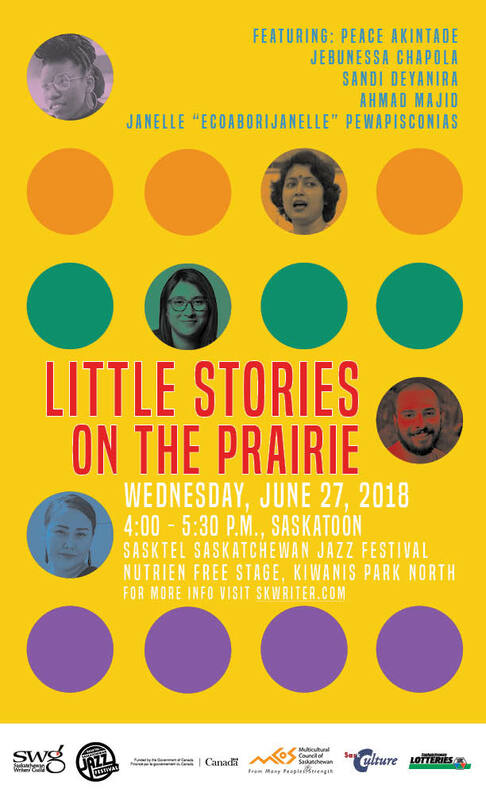 She became co-writer and actor for the play “HERE” at Persephone Theater in 2016, performer for the Moving Stories Saskatoon bus tour in 2015, A Spoken Word speaker for the Open Door Society, and currently part of the Advisory Council for the Tim Horton Children Foundation. She helps her mother run the Fruitful Vine Foundation and Production. Winner of the 2017 Underground Slam, and proud member of the Write Out Loud Youth Poetry team in Saskatoon. All of this achieved before the tender age of 16. Her lifelong dream is to own her own skyscraper and/or Art Gallery. With a head consumed within the clouds, and an unnatural obsession with the cultures of others. Her poems express her undying love for ironic justice, motivational banter, uncontrolled imaginations, and the trouble of cultural barriers. Janelle “ecoaborijanelle” Pewapsconias is a Nehīyaw Iskwēw from Little Pine First Nation, Treaty 6 Territory. eco writes about resilience, healing, and connection to land in her spoken word poetry practice. She uses her microphone to amplify her truth and share her perspective on the many stories she shares. ecoaborijanelle speaks from the experience of an Indigenous woman, but reminds everyone that her perspective does not represent all Indigenous people to Turtle Island. Sandi Martinez is a Mexican American poet who now calls Canada home. She was placed fifth on Saskatoon’s Finals stage, and competed at CFSW with the 2016 Saskatoon Slam Poetry Team. Recently, she had work published in the Tonight It’s Poetry anthology called “Poetry All Over the Floor”. Her poetry reflects her journey crossing borders, and her struggle in finding what being Mexican American means to her. Aside from poetry, Sandi is also an aspiring author, and is currently working on writing her first novel. Jebunnessa Chapola is a feminist researcher, singer, cultural performer, community radio host, social justice activist, and community volunteer. Born and raised in Bangladesh, she mother of two young girls. She attended postsecondary institutions in Bangladesh, Sweden and Norway, and is currently pursuing her PhD in women and gender Studies at the University of Saskatchewan. She is passionate and committed to helping immigrants, visible minorities and Indigenous communities around the globe. She received the Betty Szuchewycz Award in 2015 for multicultural work. She is the winner of 2015 CBC future 40 for community leadership, social activism and volunteerism. She is also the winner of 2016 Gail Appel Global Citizenship Award (ISSAC, U of S). Recently she became the winner of Graduate Students’ Association (GSA), U of S, 2017 Excellence in Community Service Award. For more information, contact Oin Nicholson, swgevents@skwriter.com or 306-791-7746.